Members of the kingdom Eumcyota or True Fungi grow in many shapes and sizes but all have one characteristic in common; their cell walls contain chitin; the same material found in the exoskeleton of insects. Taxonomists group the Eumycota into 5 divsions. 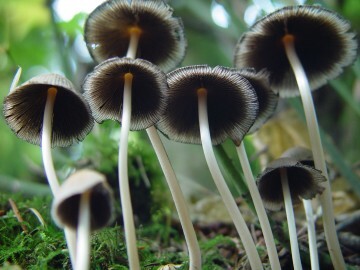 Only the species of fungi belonging to two of these divisions are visible to the naked eye, the rest are microscopic. All specimens of large fungi or macrofungi, if viewed under a microscope, have threads, hypha, with walls, septa. The two main groups or divisions the that comprise the macrofungi differ in how they produce spores. It takes a microscope to see the details of these key features but its helpful to recognize the division names as you will find them in most field guides. Ascomycetes, members of the divsion Ascomycotina produce their spores inside microscopic sacs or 'pods' called asci. Basidiomycetes or members of the division Basidiomycotina produce their spores on the surface on basidia, microscopic club or prong-shaped structures.